These 12 gauge TruBall hollow point rifled slugs are engineered to rival the accuracy of sabot slugs out of rifled shotgun barrels. 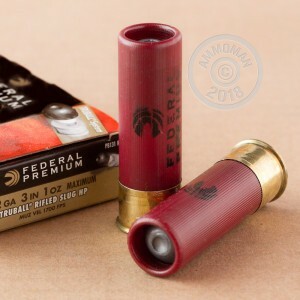 Federal knows that most hunters shoot rifled slugs out of smooth bore barrels, and far less use sabot slugs with rifled barrels. So they designed this ammo with that in mind. The TruBall slug system produces the most accurate groups on the market, with 2" groups at 50 yards. It has a maximum effective range of about 120 yards. This ammo has a 1 ounce HP rifled slug, with a muzzle velocity of 1300 feet per second and muzzle energy of 1642 ft/lbs of force. The hollow point on this slug provides devastating knock-down power, and if you hit vitals, your target should hit the ground on the spot. Don't go into deer season without having the best and most accurate slugs available. 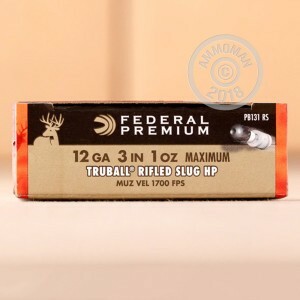 Order enough of this ammo to last the entire season, and good luck in the field!